Pakistan's new Prime Minister Nawaz Sharif has called for an end to US drone strikes in his first address since being re-elected to the post. "We respect the sovereignty of others and they should respect our sovereignty and independence. This campaign must come to an end," he told MPs. 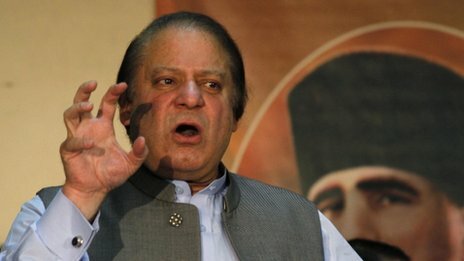 Mr Sharif, who was ousted in a 1999 coup, will be sworn in later for an unprecedented third term as PM. He faces numerous challenges, including Taliban attacks and a crippled economy. The BBC's Orla Guerin in Islamabad says that Mr Sharif's re-election is an extraordinary comeback for the centre-right leader. In his speech to parliament after MPs approved him as prime minister, Mr Sharif also pledged to tackle corruption and reduce unemployment and power cuts. 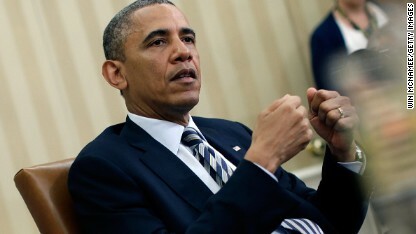 He told MPs that it was necessary to work out a joint strategy to stop drone strikes. "We must learn others' [American] concerns about us, and express our concerns about them, and find a way to resolve this issue," he said. "These drone strikes that rain in every day have to stop." The BBC's M Ilyas Khan - who was in parliament to hear Mr Sharif speak - says that the underlying message was that US concerns about militancy need to be addressed. In his remarks to the National Assembly, Mr Sharif also appealed for unity, while stressing that improving the economy will be his top priority. But to do that he may need a bailout from the International Monetary Fund. 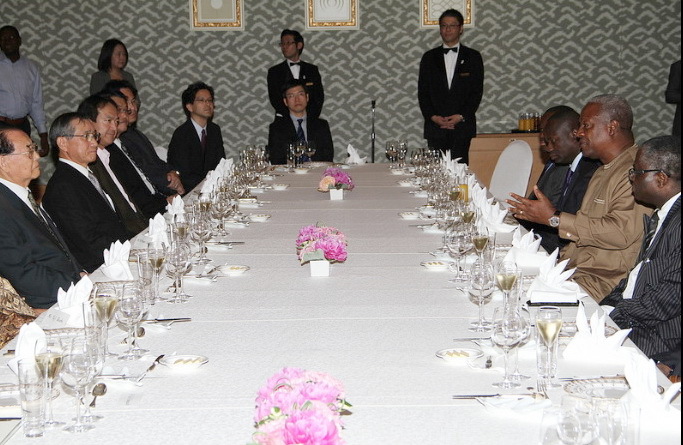 President John Dramani Mahama on Saturday night joined the Emperor and Empress of Japan and the Japanese Prime Minister at the 2nd Hideyo Noguchi Africa Prize Awards and Commemorative Banquet at which two distinguished personalities were recognised for their outstanding work in the fields of medical research and medical services aimed at combating infectious and allied diseases. 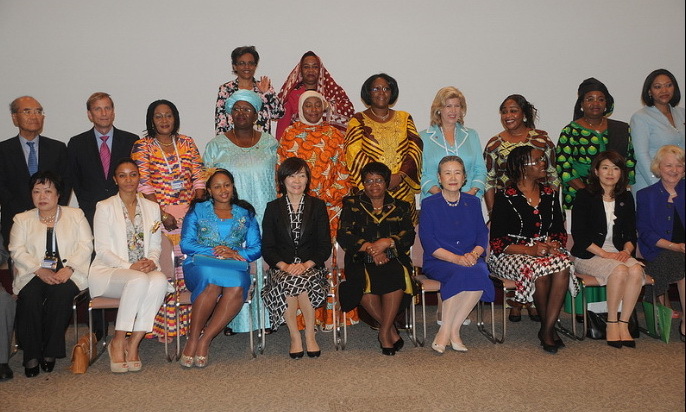 First Lady Mrs Lordina Mahama and other first ladies on Saturday participated in an International Symposium on HIV and AIDS as part of the on going 5th Tokyo International Conference on African Development in Yokohama, Japan. Trade unions claiming 240,000 members are throwing their weight behind anti-government demonstrations across Turkey. The KESK confederation of public sector workers was calling a two-day strike starting Tuesday to protest what it called the "fascism" of the governing party of Prime Minister Recep Tayyip Erdogan, who has become one of the focal points of demonstrators' anger. They have united demonstrators from across the political spectrum against a common foe: security forces who unleashed tear gas and water cannons on them in response to what had been largely peaceful protests against Erdogan's government. 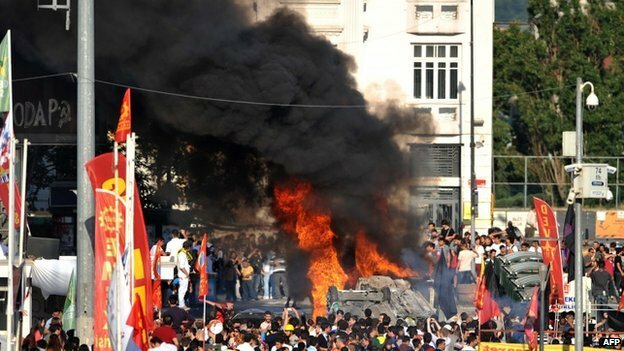 The Turkish Medical Association claimed that at least 3,195 people had been injured in clashes Sunday and Monday. Only 26 of them were in serious or critical condition, it said. One protester, Mehmet Ayvalitas, died of his injuries, the association said. And the governor of Hatay in southeastern Turkey said that a 22-year-old man, Abdulah Comert, was killed with a firearm by unknown suspects during demonstrations late Monday, the semi-official Anadolou News Agency reported. The medical association reported that the bulk of the injuries occurred in Istanbul, where the protests began before spreading to Ankara, Izmir, Adana and other locations. 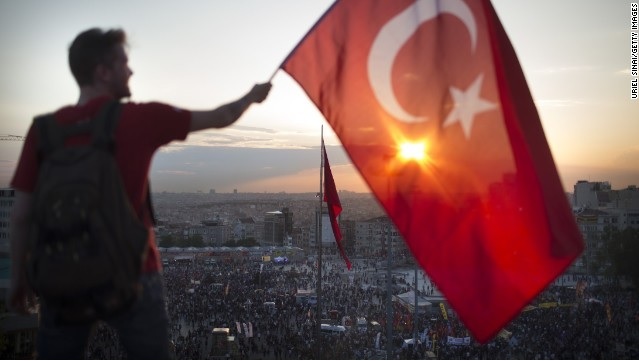 After chaotic scenes in the streets Monday that continued late into the night and sent tear gas wafting through the air, the situation was relatively calm on Tuesday morning in Istanbul's central Taksim Square, near the park where the protest movement began. Barricades remain up around the square and Erdogan's opponents appear determined to continue the demonstrations despite the prime minister's comment Monday that he expects the situation to return to normal "within a few days." The protests began after plans were made to raze Gezi Park, the last green space in central Istanbul, and replace it with a replica of 19th-century Ottoman barracks. The development would contain a shopping mall. What began as a sit-in by a handful of angry residents quickly grew into a larger protest. Riot police moved in, using tear gas and pepper spray. Protesters responded by hurling bottles, setting up barricades, blocking bulldozers and burning trash in the middle of the street. Then, outraged by the behavior of security forces, demonstrators began attacking police. The protests have since morphed into larger complaints against Erdogan, whom protesters call paternalistic and authoritarian. International groups including Amnesty International have criticized the police response as excessive. In Ankara Sunday night, a CNN crew witnessed authorities roughing up at least one protester. One police officer kicked a CNN videographer, CNN's Nick Paton Walsh reported, and a CNN crew in Istanbul Sunday also witnessed bloodied protesters. Erdogan, who left the country Monday on a four-day trip to North Africa, has responded by dismissing the demonstrations as the work of "extreme elements" and marginal groups. "My smart citizens will recognize this, then they will give them the right lesson," he said. But Turkey's president, Abdullah Gul, took a somewhat more conciliatory tone Monday, saying "the messages sent in good faith have been received." In Istanbul, the crowds have been chanting "Tayyip resign" -- referring to Erdogan -- and "Shoulder to shoulder against fascism." The protests have spread to 67 of Turkey's 81 provinces, according to Anadolu. Hugh Pope, a senior Turkey analyst with the International Crisis Group, called the protests "completely unprecedented" and said Erdogan was caught off guard. Most demonstrators, Pope said, are "overwhelmingly ordinary people" who simply want their voices heard. "However, there are other demonstrators who are somewhat more opportunistic in the left-wing factions who normally don't get much in the way of airtime in Turkey and are camped on Taksim Square," Pope said. Erdogan has defiantly praised his government's accomplishments in overseeing a decade of strong economic growth in Turkey. His party has won the past three elections, most recently securing 49.95% of the vote in 2011. "What you have is essentially a large group of Turks who feel alienated from this government, in power for 10 years," said Richard Haass, a Middle East analyst at the Council on Foreign Relations in Washington. "It's increasingly a one-party country. All the politics happen within it. The opposition is weak, divided, feckless," he said. "You have a lot of people in Turkey who feel both alienated and intimidated by the government, and this is the way they decided to push back." A service is being held at Westminster Abbey to mark the 60th anniversary of the Queen's Coronation. Some who took part in the 1953 service are in the 2000-strong congregation. Archbishop of Canterbury, the Most Rev Justin Welby said the event honoured "60 years of commitment". Nigeria’s Inspector General of Police Special Task Force on Anti-Pipeline Vandalism, led by Mr. Friday Ibadin, an Assistant Commissioner of Police, has arrested three Beninese and one Ghanaian for pipeline vandalism in the communities around the Atlas Cove, Lagos. Boston (CNN) -- For Erika Brannock, Monday was a long time coming -- 50 days in fact. Mozambique has begun registering voters for upcoming polls amid heightened political tension, with the main opposition Renamo threatening a boycott after its feud with the Frelimo-led government descended into violence. Turkish PM Recep Tayyip Erdogan says the continuing anti-government protests do not constitute a Turkish Spring. The Abia State Police Command has arrested a 25-year-old man, Chisom Ihemebirim from Amuzi Obowo in Imo State, for selling his one and half years old son, Chidubem Chisom for N500,000. The command also arrested one Abraham Ukaiwe, 27, from Asaga Ohafia in AbiaState said to be Ihemebirim’s accomplice in the deal to sell the boy. Little Chidubem Chisom was said to have been sold to one Mercy Nwachinemere, 45, of Umudi Abayi in Osisioma, Abia State who has also been arrested. According to the Police Commissioner, Mohammed Tilli Abubakar, little master Chidubem Chisom was recovered from the buyer. Parading the suspects, Abubakar said his men moved into action following a report by one Kasarachi John, 23, from Mbawsi in Isiala Ngwa North Council said to be the estranged wife of Ihemebirim. Kasarachi John, according to the Police Commissioner, reported that sometime in February 2013, she had a misunderstanding with Ihemebirim, her husband which made her to leave his house. According to her, shortly after, in March 2013, she received information that their son, Chidubem Chisom, has been sold by the father, Ihemebirim. Speaking to journalists, Ihemebirim admitted selling the boy for N500, 000. According to him, he used the money to process documents he wanted to use to travel to Libya or Spain. He also claimed that he used part of it to renovate his house. CP Abubakar said that the fraction of the money was recovered from Ukaiwe, the said accomplice. The command has also arrested a female suspect, Kate Agharanya 41, for conspiring with one and Onyinyechi Nwogu still at large to sell a baby boy for N200, 000. 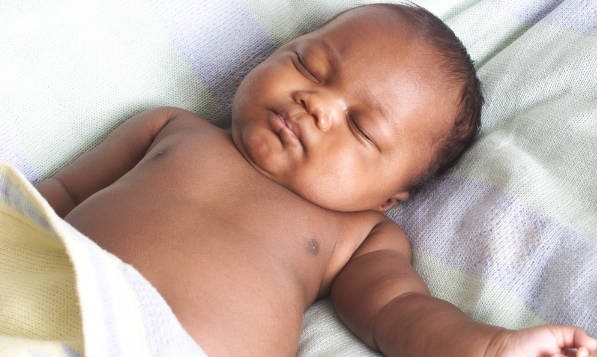 The matter the police commissioner said was reported by the mother of the baby, one Victoria Nwachukwu, 20 years, of Obazor Asa in Ukwa West area of Abia state who claimed that she delivered the said baby on May 6, 2013, at Chile Maternity Home in Umunka in Ugwunagbo. Abubakar who said that the matter is still being investigated, announced that both Onyinyechi Nwogu and the unnamed buyer of the baby were still on the run. Meanwhile, the Abia police Command also arrested and paraded four suspects for robbing a Catholic school, Daughters of Mary Mother of Mercy [DMMM] at Mbawsi in Isiala Ngwa North Local Government Area of the state. The suspects were Chimezie Omasi, Odinakachi Ugorji, George Ohia and one Confidence, whose surname, the police said was yet unknown. They were said to have robbed the occupants of the school at gun point. According to the police Commissioner, they robbed the occupants of the sum of N350, 000 cash, four Nokia Handsets and one Laptop valued at N200, 000. The police commissioner disclosed that when they were arrested the sum of N97, 200, some of the handsets, one locally made single barrel short gun, the laptop and unregistered Ladies Motorcycle said to have bought on the same day by one of the suspects. 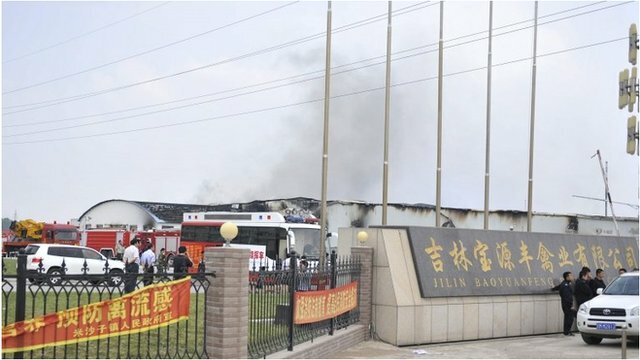 A fire at a poultry processing plant in China has killed at least 119 people, officials say. 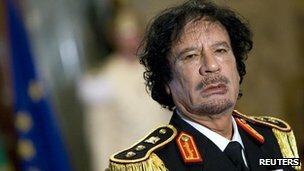 South African officials are investigating claims ex-Libyan leader Muammar Gaddafi and his family stashed $1bn (£600m) in assets in the country. South Africa’s Secretary-General of metal workers' union Numsa Irvin Jim says President Jacob Zuma should take decisive action to protect the South African economy. 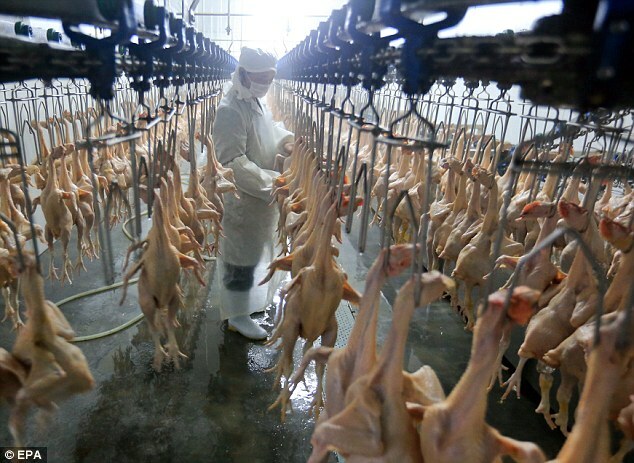 (Reuters) - A fire at a poultry slaughterhouse in northeastern China killed at least 55 people on Monday with others believed to be trapped, state media said. 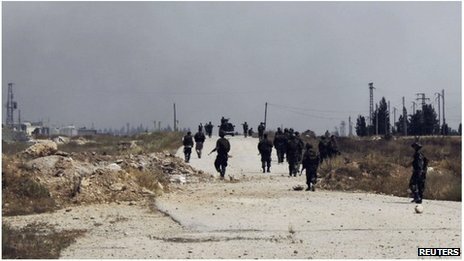 A number of people have been killed in an exchange of fire between Syrian rebels and fighters from the Lebanese militant group Hezbollah, say reports. A runway maintenance at the Moi International Airport (MIA), Mombasa on Sunday forced the diversion of four local and international flights to Jomo Kenyatta International Airport (JKIA), Nairobi and Kilimanjaro, Tanzania. Nine people were killed in tornadoes that swept through central Oklahoma on Friday, part of a storm system that caused widespread flooding in Oklahoma City and its suburbs the state's chief medical examiner said on Saturday. Washington (CNN) -- When President Barack Obama headed to the Jersey Shore this week to tout the recovery effort from Superstorm Sandy, congressional Republicans sought to keep the nation's focus on Washington. In an unprecedented move to rescue Africa from the tenacious grip of underdevelopment, Japan has announced a 3.2 trillion yen ($32 billion) assistance package for Africa as part of its commitment to put the continent on the path of growth. 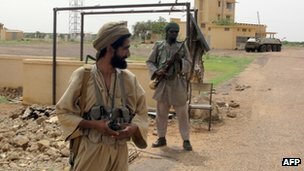 Gunmen have attacked the main prison in Niger's capital, Niamey, killing at least four people, officials say.